For many people, Christmas is a time of enjoying time with family and friends, good times and relaxation. But for a many other people, Christmas is a time of loneliness, isolation and sadness. Whatever the reason, here are some tips for coping with loneliness at Christmas. If you’re mobile and able to move around, make sure you stay active. Even moderate, regular exercise has multiple benefits for your mental health. When you can stay active and not let yourself become too sedentary, your mood rises and you’ll feel more positive. When your mood is more positive, you’re then more likely to reach out and connect with the people around you. And feeling connected is an essential ingredient for good mental health. Try to exercise with a friend or participate in team sports to reduce your isolation. This also helps you develop more relationships with people who can become important to you over time. Don’t just wait for people to contact you to invite you to holiday social events. Instead, start planning and organising your own social events. You don’t have to organise a huge party. Catching up with a friend for coffee, inviting a friend to see a movie, or calling a friend to go for a walk is a great way to make sure you don’t end up being alone during the Christmas period. If you have a tendency to feel lonely during Christmas, plan ahead so you have at least two social events organised a week. Volunteer work is a great way to avoid feeling lonely at Christmas. Many people are in need at this time of the year and are in worse circumstances than you. Through volunteer work you can experience altruism. Altruism is the act of selflessly caring about the welfare of others. A great side effect of being altruistic is you end up feeling good yourself from giving to others. Check for charity events online that are looking for volunteers or enquire with the charities in your local area. They will be grateful for your contribution and you will be giving back to others through contributing to the well-being of your community. 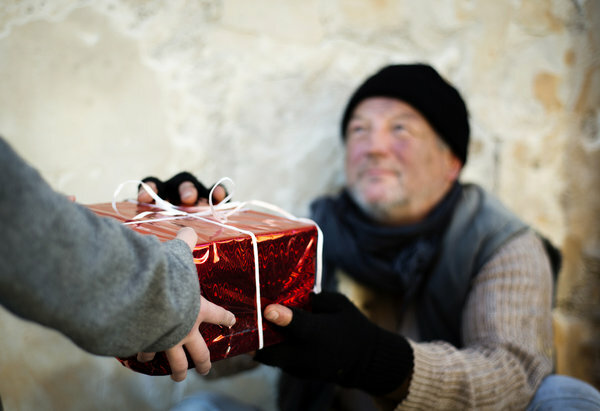 One of the best things about Christmas is not receiving gifts, but giving gifts to others. Giving gifts to others is a wonderful way to show your appreciation for those you care for or are special to you. You don’t need to go out and spend hundreds of dollars. Remember, it really is the thought that counts and people will appreciate small gifts because it shows you have thought about them. When you give some thought to your gift, your friend or loved one will feel special and loved. This will then flow onto you feeling warm and positive from giving to someone you care about. There’s a lot to feel grateful for when you look around. The practice of gratitude is a great way to move out of feeling sorry for yourself and your circumstances. When you can take time to reflect on all the things you have to be grateful for in your life, your troubles immediately become less significant. The benefit of this is you can then see your situation with a big picture perspective and shift your mood. This then gives you greater abilities to creatively problem solve and come up with new ideas and make good decisions in your life. People that feel positive and appreciate life naturally attract more people into their life. The reality is people love to be around other people who are positive and make them feel good. So through the regular practice of gratitude you will attract more people into your life and reduce your loneliness. If you feel you’re struggling with loneliness if your life, contact Clinton Power + Associates on 0412 241 410 or book online for a FREE 15-minute phone consultation with one of our experienced and qualified relationship counsellors to hear how we can help you.